Last year, as many as 1.8 crore schoolbags were sanctioned for students from Class 1 to 8 by the Samajwadi Party government. But midway through the distribution, assembly polls were declared in the state. Under the model code of conduct, the undistributed bags, carrying the images of Akhilesh Yadav, had to be stowed away. 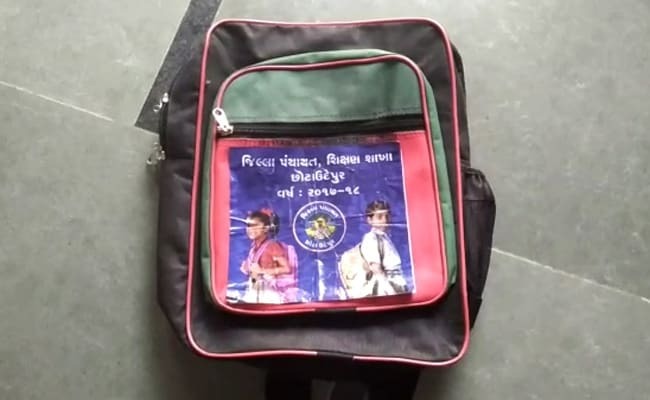 School bags distributed in Gujarat had pictures of Akhilesh Yadav under the administration's sticker. Ahmedabad: Around 12,000 bags distributed by the local administration left many perplexed in Gujarat's Chhota Udepur this week. The bags carried a sticker with a panchayat logo. But when children peeled it off, they found another sticker beneath it -- one that was very unexpected. It was a photograph of Akhilesh Yadav, the former Chief Minister of Uttar Pradesh, indicating that the bags had been made to be distributed to children there by the erstwhile Samajwadi Party government. The bags were distributed as part of "Shala Pravesh Utsav" -- an annual government event meant to increase school enrollment -- in Chhota Udepur, a town 9 hours away from Ahmedabad. The administration officials appear flummoxed. The state's education department has started an inquiry. During its five-year term, the Akhilesh Yadav government had distributed not only bags, but laptops and other study material and even dinner plates to school children in Uttar Pradesh. Last year, as many as 1.8 crore schoolbags were sanctioned for students from Class 1 to 8 by the Samajwadi Party government. But midway through the distribution, assembly polls were declared in the state. Under the model code of conduct, the undistributed bags, carrying the images of Mr Yadav, had to be stowed away. The BJP government led by Yogi Adityanath which succeeded him, allowed the distribution of the schoolbags, even though they carried the photograph of his predecessor. Officials said the saffron-clad 45-year-old Chief Minister was not in favour of wasting public money for "political ego". Besides, he wanted the bags to reach students in time for the new school session, which begins in April.